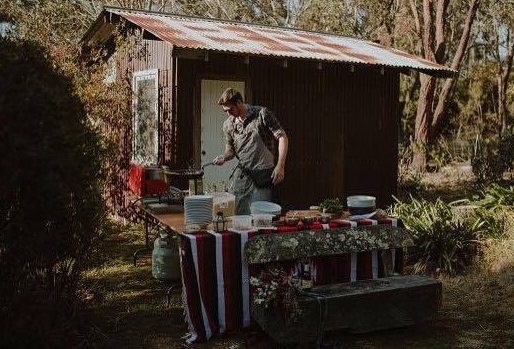 My pop up kitchen for a 17 guest full vegan elopement in the Blue Mountains!! As ‘The Wilderness Chef,’ I create unique and exclusive dining opportunities in locations unimaginable (worldwide)... I am also the Executive Chef of Newcastle cafe/restaurants 'Talulah Bar’ & ‘Equium Social’. I call Newcastle (NSW) home, so I can easily cater the Hunter Valley and Nelson Bay areas, as well as Sydney & western NSW. But are you keen to travel??? I am a travelling chef (it's what I do). Be it interstate or international you can count me in...I have already catered in Mt Hotham, Blue Mountains, Tasmania and even New Zealand (to name a few) and I am ready to broaden my horizons! I am passionate about creating incredible food, designed to be enjoyed amongst family & friends in any location imaginable!! I believe in living life in the most sustainable manner for not only the environment, but also ourselves and those around us. You will often find me camping in my rooftop tent, fishing or foraging for the freshest produce, going for hikes & sitting around the fire. I make my food available to all guests, at any event, in any location imaginable...whether it be a corporate business function or a camping trip with a few mates. I can cater your wedding, workshop, feast, elopement, engagement, private dining experience or weekend away for any number of guests. I believe everyone should be able to enjoy the food they love so all menus are custom designed to your taste, event, dietary requirements & budget! Choose from wilderness feasts, canapés packages, grazing selections, banquets or alternate drop dining.